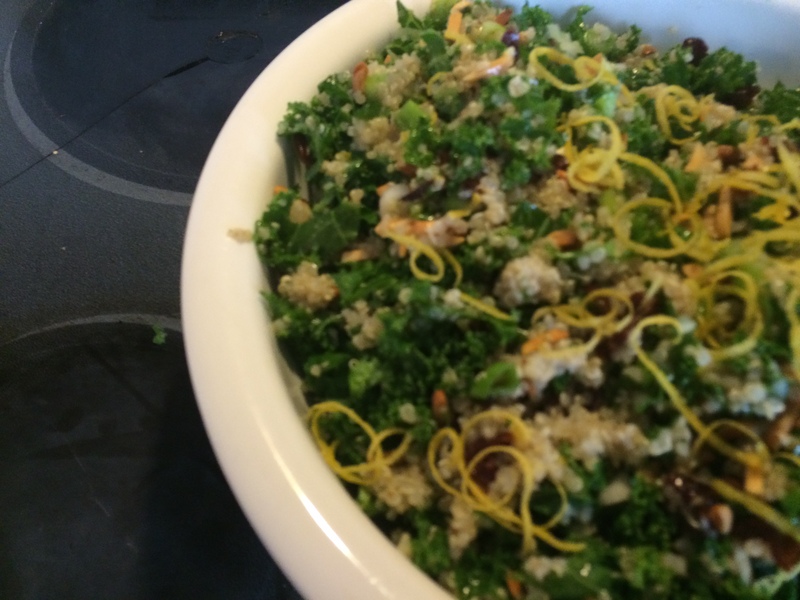 The original inspiration for this salad came from Smitten Kitchen. I’ve had to make several changes to accommodate the availability of ingredients in our rural area. The end result was a hit with the family and I’ve made it several times since. 1 large bunch of kale (I’ve used both the curly kale and the dinosaur (aka Lacinator) kale. 1 bunch of scallions, sliced part ways up into the green stalk. 1/2 cup slivered almonds, toasted until light brown and cool. Rinse the quinoa thoroughly. Place the quinoa in a small saucepan with 1 1/2 cups boiling water and a 1/4 tsp. sea salt. Cook for 10-15 minutes, until tender. Rinse quinoa well in cold water and drain. Set aside. Add the quinoa, scallions, cherries, almonds and mix well. Whisk the dressing ingredients together in a small bowl. Pour over the dressing. Grate some lemon zest over the salad. Season with additional salt and pepper if desired. Add the Feta cheese to the individual servings. This servers 3-4 as a meal or several smaller servings if used as a side. Surprisingly, this salad will keep well in the refrigerator for a day. I love Sunday morning breakfast. Church is later in the morning, and it’s fun to make a special meal when I have time to spare. 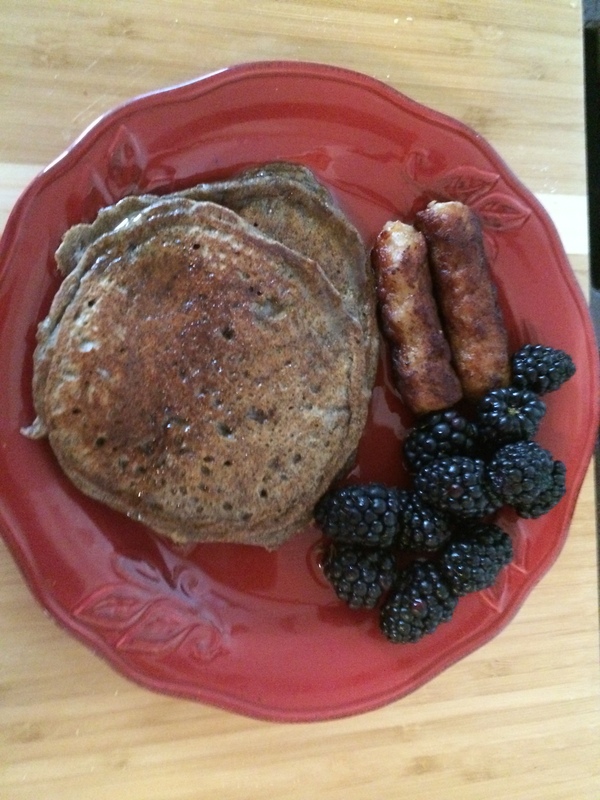 Buckwheat pancakes with real maple syrup, sausage, and fresh fruit is one we really enjoy. I got the original recipe from Simply Recipes and made it our own. Buckwheat has an earthy flavor and Simply Recipes says you can substitute the wheat flour for all buckwheat (which is gluten free). I haven’t tried that. Heat a griddle or non-stick pan to medium heat. Pour melted butter over dry ingredients and start mixing. Add the slightly beaten egg to the buttermilk. Slowly add buttermilk mixture to dry ingredients until you get the desired consistency for the pancakes. You may need to add or not use all buttermilk. Put a small amount of vegetable oil or spray on the heated pan/griddle. Pour about 1/4 cup batter onto the griddle. Cook until bubbles appear on top (3.4 minutes). Turn for an additional 2-3 minutes or until nicely browned. Serve with warmed REAL maple syrup, the fresh fruit of your choice (we use a variety of fresh berries), and sausage or bacon if desired. I’ve always liked Apple Crisp from when my Mother and Grandmother used to make it when I was a child…. fond childhood memories, comfort food and all that goes with it! 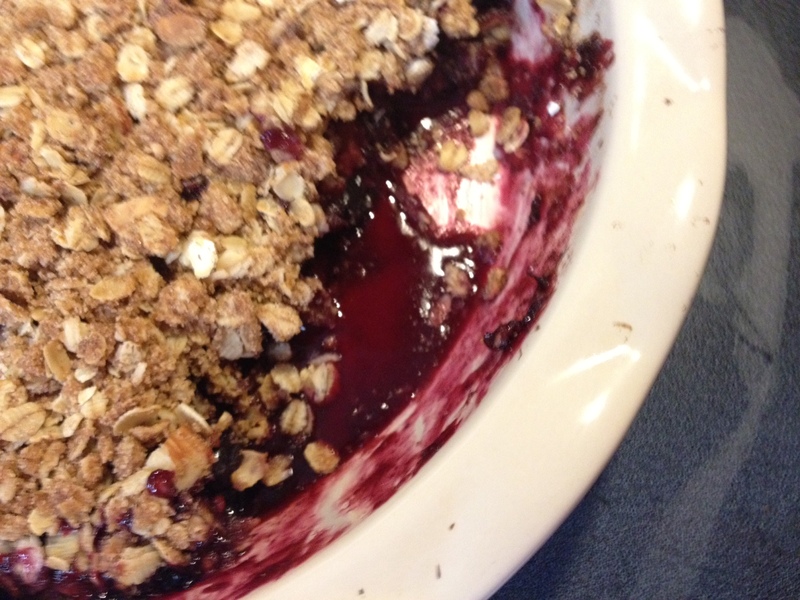 My daughter recently made a Berry Crisp when we were visiting her – it was sumptious. Got the recipe from her and adjusted to what we had on hand. The fruit measurements are close to what I had available. You can use any combination you have on hand just so you have 4 1/2 – 5 cups of fruit – even if it’s only one or two kinds. I’ve been thinking of using peaches or nectarines for one of the fruits sometime. Berry Crisp – fresh out of the oven. One helping removed before it even cooled! 1 tsp. cinnamon (I love Penzey’s Vietnamese cinnamon. 1/3 cup light brown sugar. Pre-heat oven to 375 degrees F.
Put all the filling ingredients in a large bowl and gently mix. Set aside. In another bowl, mix topping ingredients (except for butter) thoroughly. Add the butter and mix again. Put the fruit mixture in a deep dish pie pan. Cover with the topping mixture, spreading out evenly. Bake in 375 degree F oven for 40 minutes or until fruit is done and topping lightly browned. Serve plain, with whipped cream, or with vanilla yogurt. This is not overly sweet, so it could easily be served for breakfast. In fact, I have had it for breakfast :-). Hope you enjoy this as much as we do! UPDATE: Updated 8/26/17 to reflect my current use of ingredients. In a small bowel combine oil, maple syrup, and vanilla. Pour the syrup mixture over the cereal mixture. Mix thoroughly to coat everything. pour in two cake pans and spread out evenly. Bake at 260 degrees for 1 1/2 hours… stir every 30 minutes to bake evenly. Remove from oven and put granola into large bowl. Let cool. 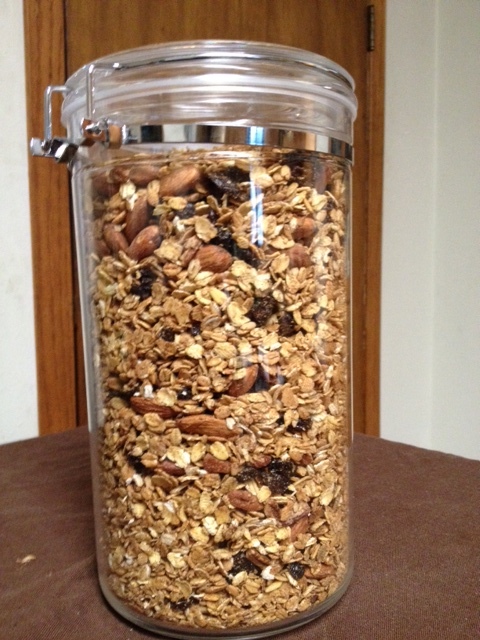 Add dried fruit and store in containers. I put this on my yogurt/fresh fruit mixture for breakfast. My son likes to eat it by the handful as a snack. There is room for a lot of variation in the recipe…. you could use a mixture of grains, add some flax meal. Substitute walnuts for the pecans. Use honey instead of maple syrup…. you get the picture :-). different than the rolled oats you get in the store. It is the whole grain groat (inner portion of kernel) that has been cut into 2-3 pieces with steel rather than rolled. It looks a bit like rice, except a golden brown. There are a lot of minor variations on how to cook steel-cut oats. Here’s what I currently use. Heat until just boiling on medium heat. (NOTE: Watch carefully!! With milk, it will come to a boil quickly). It takes 20-25 minutes to cook. It has a pearly texture when finished cooking. Pour into 4 cereal bowls. Top with honey and cinnamon. You may wish to serve with fruit and/or maple syrup. My husband puts chocolate syrup on his and thinks it tastes like chocolate chip oatmeal cookies. Thin with additional milk or water if needed. You can make this with only water, but the milk gives it a nice creamy flavor. You can find steel-cut oats in most grocery stores. It’s a bit spendy, but my son has found it for a fraction of the price at a local food coop. I like to explore the use of some of the more unfamiliar grains in cooking — so this weekend decided it would be amaranth since I’ve had some in my cupboard for a couple weeks. 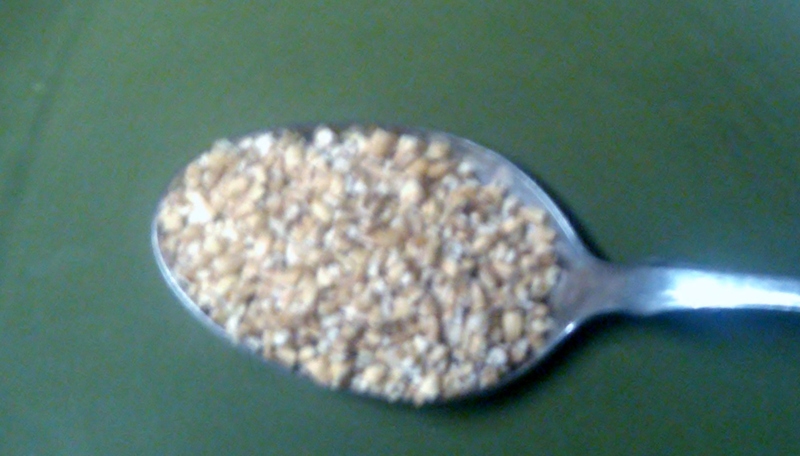 Amaranth is a small, nutty type of grain and is considered a complete protein source. It was a staple in Aztec and Inca cultures and was even used in religious ceremonies. I will occasionally make a pilaf with the grain for something different. Last weekend, I made the pilaf below which I found in my “Clean Eating” magazine, made a few changes and this is the result. This pilaf has a bit of a kick to it and thought it went well with the roast chicken and roasted asparagus. 3. Add chicken broth, tomatoes, thyme, saffron, salt and peppers. Bring to boil. Stir in amaranth, bringing back to a boil. Reduce head and simmer, uncovered, for 20 minutes or until liquid is absorbed. 4. Remove from heat and let rest a few minutes before serving. Will post some recipes for quinoa, bulgur, and barley in the future as time and ambition permits.